MSD's Flying Magnet Crank Trigger system stabilizes ignition timing. Stable ignition timing is a necessity in performance engines. In most cases, a distributor will do just fine, but when you start making big-time horsepower with extreme cylinder pressures, the timing is critical to both the performance and the life of the engine. The ignition must be triggered at a precise time in relation to the position of the piston the compression stroke. Think of all the mechanical stretching and flexing that takes place through the timing chain, gears and cam before the distributor pickup triggers the ignition. The crankshaft on the other hand, knows exactly where each piston is, plus it is the most stable component of the engine in relation to piston position. That's why a crank trigger for timing is so important in high horsepower engine applications. Most crank triggers use steel studs that stick out of the wheel to trigger a magnetic pickup. However, the stationary magnet can be triggered by track debris, vibration or even bolts. MSD uses a non-magnetic pickup which gets triggered by powerful magnets that are embedded in the trigger wheel. This ''flying magnet'' design cannot be false triggered. The only way to trigger the ignition is when a magnet passes the pickup. This non-magnet pickup is securely held in position by CNC machined aluminum brackets. These brackets feature a long adjustment slot providing a large range of accurate timing adjustments. Plus, many of the brackets can be used on either side of the balancer for easy installation. Most kits are supplied with several spacers for different accessories and pulley systems. The crank trigger timing wheel is also machined out of 6061-T6 aluminum and anodized MSD Red. Each ''rare earth'' magnet is pressed and then riveted into the wheel to handle the fierce rpm and vibration that high horsepower engines put out. By installing the magnets in the trigger wheel, MSD has done away with the chance of false triggering. As the engine is rotating, the magnets pass the Non-Magnetic Pickup and create a signal that triggers the Ignition. The magnets are the only thing that can trigger the ignition making it the most reliable and accurate way to trigger your ignition. 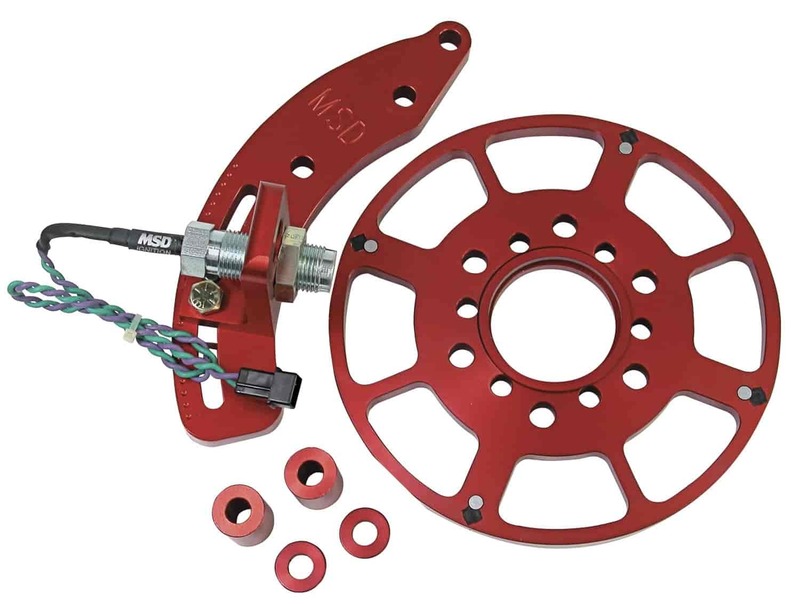 All MSD Flying Magnet Crank Trigger Kits must be used with an MSD Ignition Control. Kits include mounting brackets, trigger wheel, non-magnetic pickup, centering ring and mounting hardware. NOTE: A locked-out distributor must be used with a crank trigger system. Does MSD Ignition 8650 fit your vehicle?